For the purposes of this post, I will refer to this type of time data as cumulative time because time in excess of 24 hours tends not to refer to a particular time of day- generally it refers to a span of time. To utilize this type of time data in Origin, some special considerations have to be made. 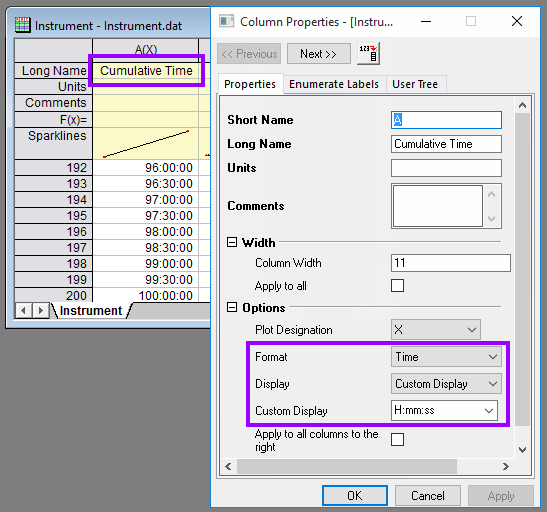 Typically cumulative time data is based on times manually recorded by an experimenter or the output of an instrument. Moreover, this type of data is time-only; it is not associated with any particular calendar date or day of year. In this blog post, I will show you how to import cumulative time data that exceeds 24 hours. I will also discuss issues with copying and pasting this kind of data, and lastly, I will show you how to convert it to fractional times. Graphing cumulative time data and/or using it in an analysis operation is straightforward, so I will not go into detail in this post. However, I have included graphing and analysis examples in the OPJ file included in a downloadable Zip file designed to accompany this post. Note: If you need to deal with time data does not exceed 24 hours, OriginLab has an excellent video tutorial on the subject. Before I start, I need to provide a little background into the inner workings of time-only data in Origin. Regardless of how it is displayed, time-only data in Origin is stored as a floating-point number (a number with both an integer part and fraction part). The integer part of a time value represents number of days and the fraction part represents a fraction of a day (hours, minutes, seconds, etc). This number is not associated with any calendar date or time. Using the aforementioned example 60:15:30, Origin internally stores that as 2.51076. If it is confusing, consider that 60 hours is 2.5 days and those extra minutes and seconds just add a little to the fractional part. Note: To find more information about time formatting specifiers and time formats in general, start with this resource. Now we can more on to our first exercise- importing cumulative time data. We can see that the first column of data in both files is in cumulative time format. 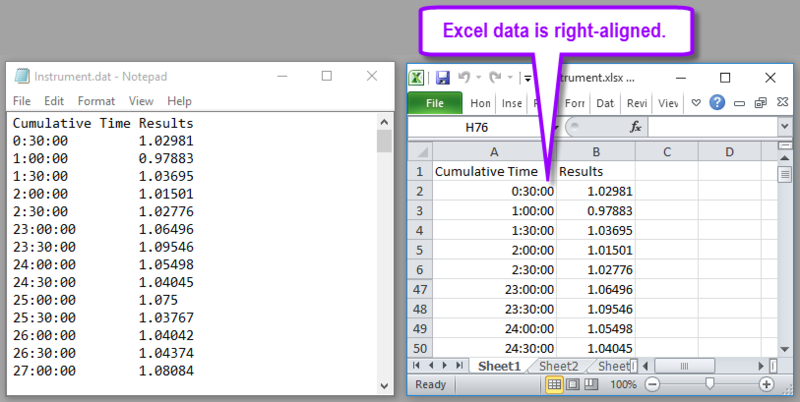 In the ASCII file, these times are plain text, but within the Excel file, the data is automatically formatted by Excel using a variant of its own custom time format (which is somewhat different than that of Origin and not really germane to this discussion). If the data in the Excel column is aligned to the left, this text-format data, not time format data (within Excel that is). When importing the Excel file, Origin can handle that this difference as I will explain in the Importing the Excel File section below. By the way- The second column in both files is simply arbitrary data that may be used for graphing and/or analysis. Drag and Drop Instrument.dat from Windows Explorer to Origin workspace. It will create a new workbook with data imported. Origin detects the first column is time and set the column as Time. By default it uses HH:mm format. Double click the column header to open Column Properties dialog. Change Display to HH:mm:ss or choose Custom DIsplay and enter H:mm:ss if you don’t want leading zeros. select File->Import->Single ASCII… menu. Select Instrument.dat to import. Follow step 3 in Method 1 to change time display. Note: If in step2 you check Show Options checkbox, then you can go to Import Options->File Structure section, enter H:mm:ss for Custom Time Format. Then after import, time column will show with Custom Time format you said. Open Instrument.dat in Notepad. Select All and Copy. Then go to a new workbook in Origin. Click first cell in col(A) and paste. Right click the first row header which contains column name and choose Set as Long Name. It will bring Communitive Time and Results into Long name row. Now the first column is left-aligned, which means it’s treated as Text. Double click column header to open Column Properties dialog. Set the Format as Time and change Display. Drag and Drop Instrument.xlsx from Windows Explorer to Origin workspace. Choose Yes to import the Excel file. It will create a new workbook with data imported. Origin converts the time into numbers. Double click column header to open Column Properties dialog. Change Display to HH:mm:ss or choose Custom DIsplay and enter H:mm:ss if you don’t want leading zeros. In Origin, create a new workbook. Select File->Import->Import Excel (XLS, XLSX, XLSM)… menu. In the File Open dialog, select Instrument.xlsx and make sure Show Options dialog is checked. In the impExcel dialog, use all default settings except in the Column Headers section, set Index of Rows for Long Name to 1. Origin converts the time into numbers. There is no Method 3: Copy and Paste since it just doesn’t work well. I will now show you how you can express cumulative time data as fractional times (which are floating point values). In terms of worksheet columns, they will have Text & Numeric as the column format because they are numeric. These expressions of time include fractional days, hours, minutes, seconds and even years (I won’t bother with months because that gets complicated since months are based on periods of a calendar). Graphing and analyzing cumulative time data is pretty standard. See the “4. Graphing & Fitting” folder in the sample OPJ for an example of how to create a scatter plot and nonlinear fit with time as X.
Chris Drozdowski is a Product Support Engineer at OriginLab. He loves to talk to customers and educate them. He particularly relishes diagnosing and solving difficult, edge-case issues. As well, he contributes code to help solve problems or enhance user experience. In his down time at work, he likes to research and write about esoteric product features. Outside of work, he enjoys spending time with his family, learning even more about coding, and exploring craft beers.